Arguably one of the greatest series in NHL history, it changed the face of hockey in the New York metropolitan area through 27 periods in seven games across 13 days, during which Ranger captain Mark Messier guaranteed a game-six victory. 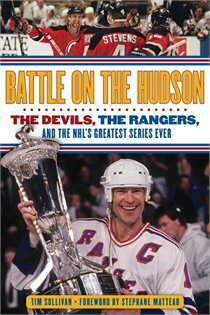 The book presents a definitive portrayal of these two determined teams: the Rangers, an original-six franchise desperate to win their first title in 54 years, and the Devils, the underappreciated new kid from across the Hudson River who feverishly wanted to forge an identity of their own. This in-depth retrospective conducts an unforgettable rollercoaster ride of emotions that lives in the hearts and minds of hockey fans forever.